Your ProDoc subscription includes unlimited, toll-free telephone support, free updates, free training that is available in a variety of convenient formats, as well as the many other support options listed below. The answers to many support questions are available here, so you can always get help, no matter what time it is. We welcome your telephone calls during normal business hours, Monday through Friday. Please phone us at 800 759-5418. Our software is very simple to use "straight out of the box." However, our goal is to make you "feel like a pro." We offer free, valuable training in a variety of convenient formats to help you and your office staff gain confidence in using all the time-saving, powerful features in your ProDoc or Small Office Suite programs. Browse through our Tips & Tricks to find helpful tips. We also encourage you to submit your own Tips & Tricks. Students enrolled in many law, paralegal, and legal secretary schools learn to use our software in their classrooms and computer labs. Here you will find printable reference cards for both ProDoc Software and Small Office Suite (SOS®). We have distilled the How-To-Do's for many of the most critical features of both products into these forms. This page contains answers to common questions about subscribing to ProDoc. 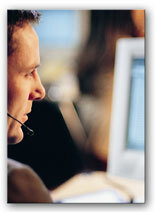 This page contains answers to common questions handled by our support staff. We also encourage you to submit your own FAQ questions.